In June of 1971, Miss Jean Grasso was an aspiring teacher who had just graduated from Molloy College, a Dominican school in Rockville Centre. Unfortunately for her, that was a tough year to try and get a teaching job in New York City. Fortunately for us, Jean's college advisor recommended that she go out to Long Island and interview for a position at a Dominican school in Huntington. Forty-one years later, Miss Grasso is still one of the most beloved staff members at St. Patrick’s School. Jean received a Master's in Education from Queens College and spent her first 33 years at St. Pat's teaching 3rd grade. Her favorite subject was Math, and she says it was those "lightbulb moments" when something clicked with a student that made it so gratifying. She also loved reading to the children each and every day. Jean fostered lasting relationships with so many of the students that were lucky enough to pass through her classroom over those years. Eight years ago, Principal Sister Maureen McDade asked Jean to transition to the role of Assistant Principal. Although she was somewhat reluctant at first, Jean quickly decided that she was up for the call. She once again went back to school and received a Master's Degree in Education Administration from Fordham University. She says the last 8 years have been very hard work (and longer hours!) but just as rewarding as her years spent teaching. After all this time, Jean's favorite part of the day remains the same: "being with the children". Whether it's talking with them in the cafeteria, seeing them in the classroom, or having them visit her (and her dog, Gracie sometimes!) in her office, interacting with the students is still the best part of it all for Miss Grasso. We have been blessed that Jean followed the advice of her college advisor 41 years ago. 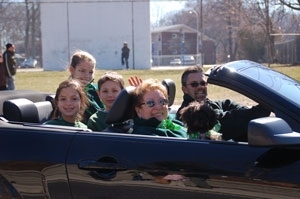 From her dedication and expertise as a teacher and administrator, to her warm smile and infectious laugh, Miss Grasso is one of the treasures of St. Patrick's School. If you have the opportunity, stop by the main office and say hello. She would love to see you and catch up!